This past Saturday we hosted another class on hypertufa building. A great bunch of folks came to learn the process, and then built their own vessel. 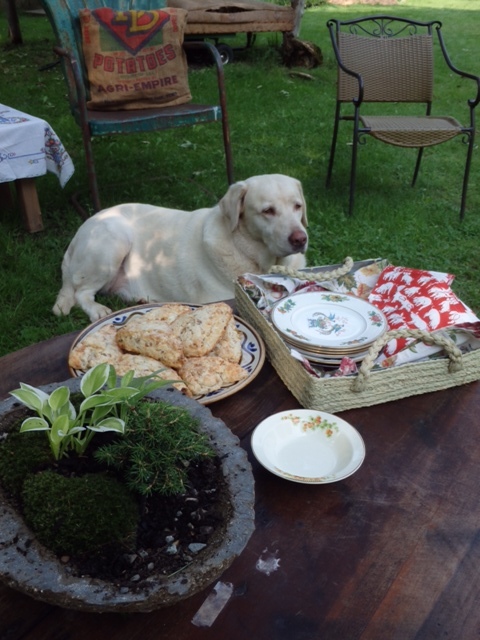 It was great, and we were so lucky to have our dog Miller standing guard over the scones while we were busy building. He is so loyal about such things! 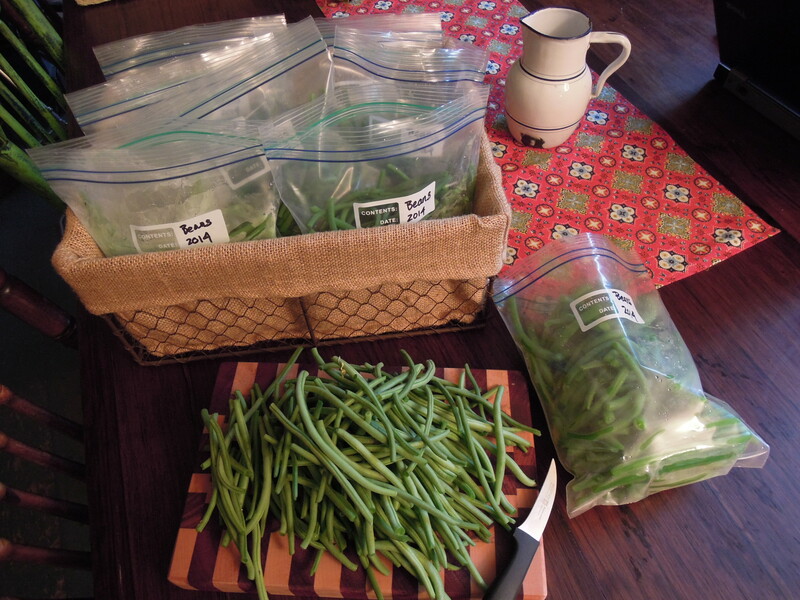 If you ever want to grow just one type of vegetable that will make you feel like the best gardener in the world, give you the feeling of endless bounty, and keep you harvesting baskets full of summer goodness on a daily basis……grow greenbeans. We pick them, being sure to collect every bean that is close to edible size, and still they grow overnight and need to be picked again the very next day. We prepared 10 pounds of beans for the freezer today, and enjoyed an ample serving of them for dinner as well. Tomorrow we are expecting rain, and this means no picking……..I can only imagine what will await us in the bean patch the following day. Oh my. As summer moves into one of its hottest months, plantng the next succession of greens, spinach , and brassicas, can be challenging. We begin new seedlings in the big greenhouse which is covered with shade cloth. The shade cloth keeps the temperature down considerably and allows us to sow seed collected from the nursery. We also start sowing seeds for late season vegetables. Brassicas, spinach, and greens are not lovers of high temperatures ( the peppers and eggplant, on the other hand, are loving it). As we begin to replant some beds with these fall crops, we also create some micro- environments of shade to keep these plants happy. 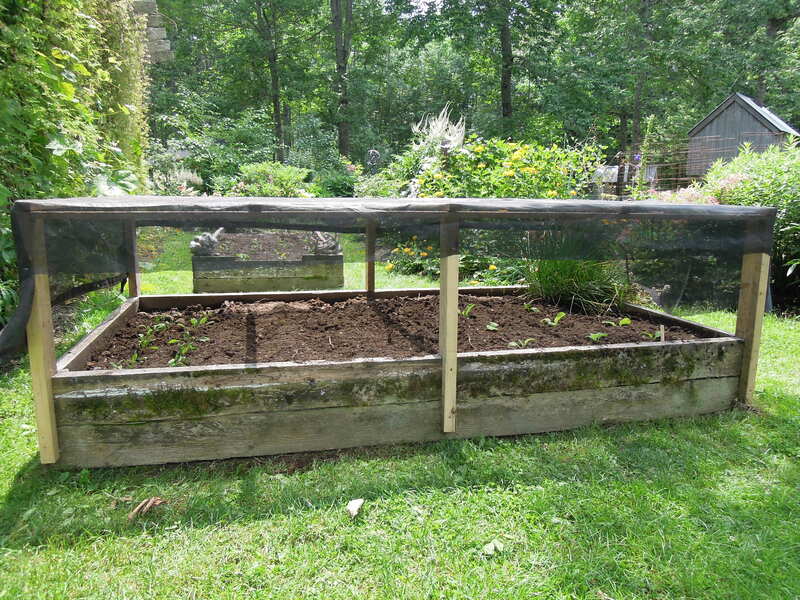 Our very excellent wwoofer, Jaime, built this over one of our raised beds. Despite constant weeding and keeping the paths mulched, the garden takes on the appearance of a jungle. The tomatoes stretch themselves into neighboring beds, the squash meander throughout, and the bean plants become so lush that the beans hide discreetly within. A bounty in the form of chaos. The ornamental gardens don’t become so wild. They are managed and kept a bit more refined. I’m sure they’re looking over at the vegetable gardens and saying ” for goodness sakes, tidy yourselves up a bit, won’t you”. It’s all fine and we are appreciating all the fresh bounty that is making its way into the house. Last night……fresh greenbeans, broccoli and tomato quiche, salad, and blueberry pie. We will not complain about the nature of that unruly vegetable garden, it’s doing its job just fine. We are also busy clearing a spot for a small studio building. 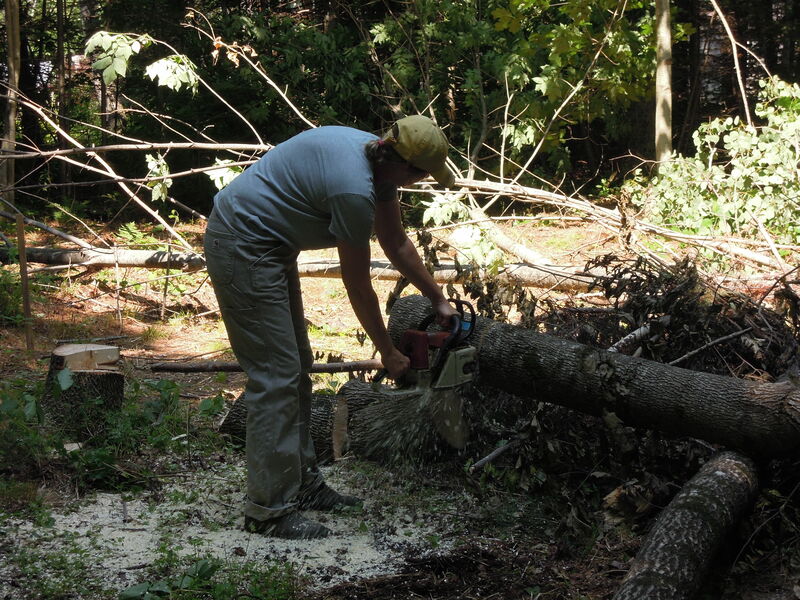 Yes, cutting wood and hauling brush when it’s 86 degrees out. At least it’s in a wooded area and perhaps a degree or two cooler. While moving pots in the stock area, I found a ( another) pair of Rick’s reading glasses. The glass was not broken but they could use a little dusting off. Goodness. We continue to restock the nursery with new plants. Many new varieties of hosta that have been waiting on the sidelines to be divided and put out. I like this time of year when we begin pulling things from the stock area and giving them a place in the nursery rows. It’s like starting all over again and keeps the sales area chock full. 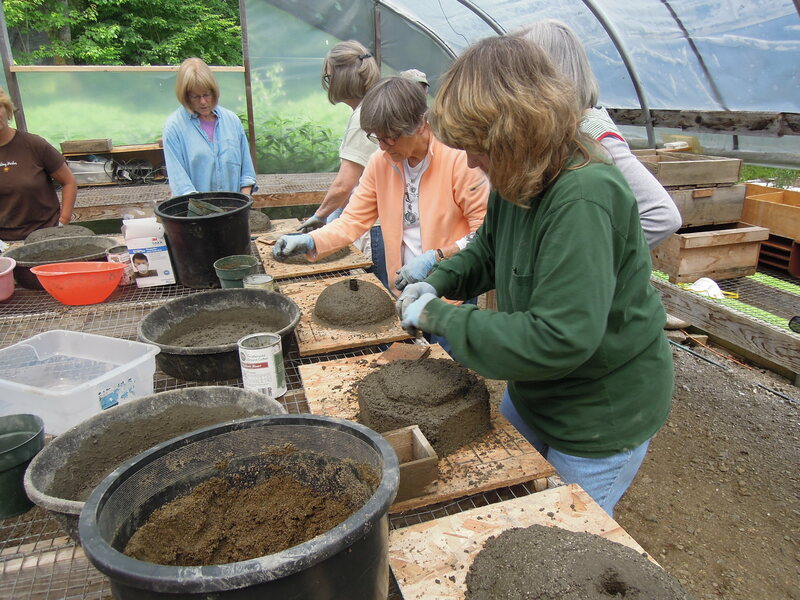 Our July hypertufa class is this Saturday and we are looking forward to another group coming. Liza Gardner Walsh will be coming August 1st from 10:00 to 12:00 for an adult fairy garden class and talk. We’ll be hearing about the history and lore of fairy gardens and then building some small fairy garden accessories…..tiny trellises, gates, and tables, etc. Come join us if you would like, there are still some spots open. Check out our class page to do so and for more information. Happy mid summer gardening to everyone and we hope your season is going well! 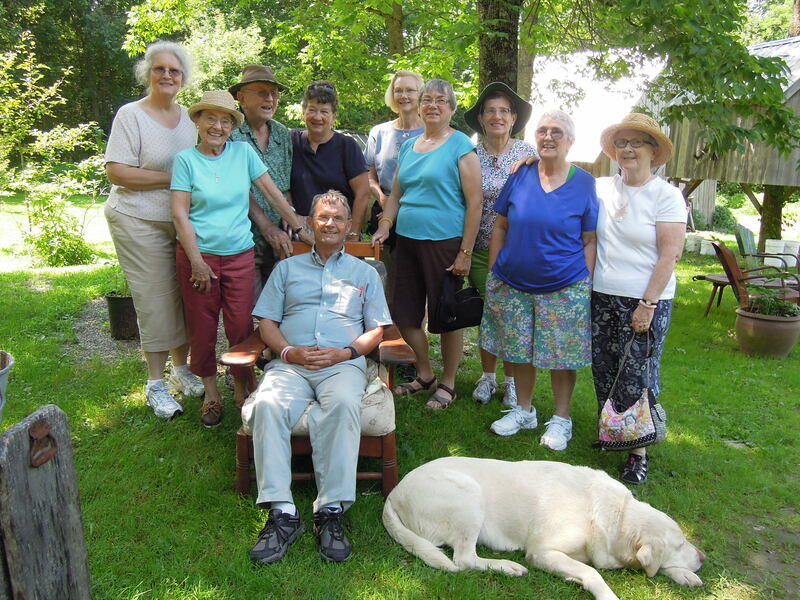 Every year Fernwood gets a visit from Sylvia Correia and her gardening group from Connecticut. They travel to the state of Maine to attend the Camden garden tour, visit the Coastal Maine Botanical Gardens, and then check out some local nurseries. We always look forward to them coming, all being enthusiastic and knowledgable gardeners, they’re interest and conversation is always a pleasure. Sylvia asked about the mulch in our display beds, with a suggestion that we do a blog on it. We mulch our beds to control weeds, retain moisture, modify soil temperature, and feed the plants. 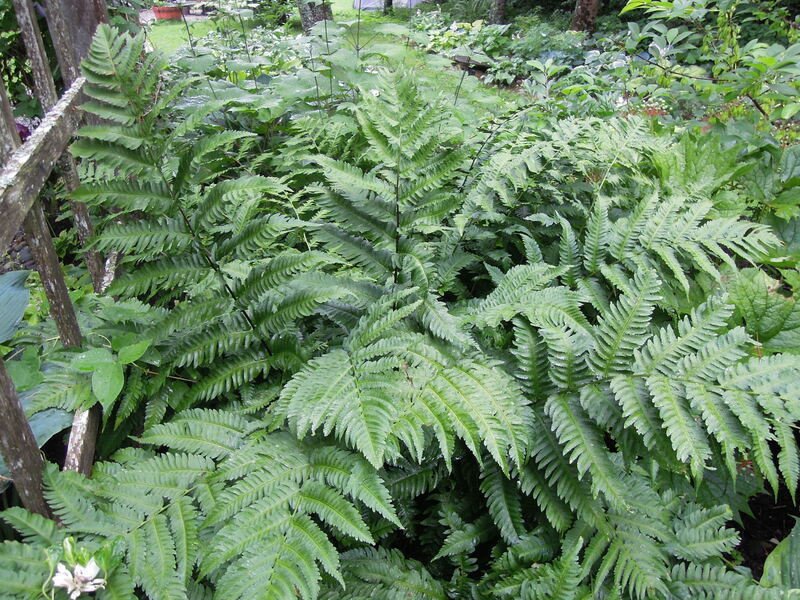 No mulching is done to protect the plants in winter. One of our favorite mulches to use is leaves. The shade here at the nursery is provided by trees, not shade structures, so we have an abundance of them in the fall. We gather them up to be used either as mulch (uncomposted) or left longer in the pile so that they break down for soil amending. Leaves that fall directly into the beds are not removed, ever. This is natures way of building soil and feeding the plants, including the trees themselves. The other mulch we use is the grass clippings from our lawn. These work very well as they break down fairly fast and form a tight mat that suppresses most weeds. They have more nitrogen in them than the leaves do. One caution. Do not use the clippings for mulch if you are mowing the seed heads of weeds on your lawn as well. For example, we do not use them when the dandelions are up, because that would amount to sowing the beds with dandelion seeds. When we are mowing grass with lots of dandelions present, we compost the cut grass. When do we mulch? We mulch as needed and throughout the growing season, from spring to fall. Can mulching inhibit seed germination with relation to plants naturally seeding out beneath or around them? Perhaps you are hoping for seedlings to transplant next season and are concerned about this. My thought is, if you are not going to collect the seed, to mulch just after the seeds fall may very well smother them. 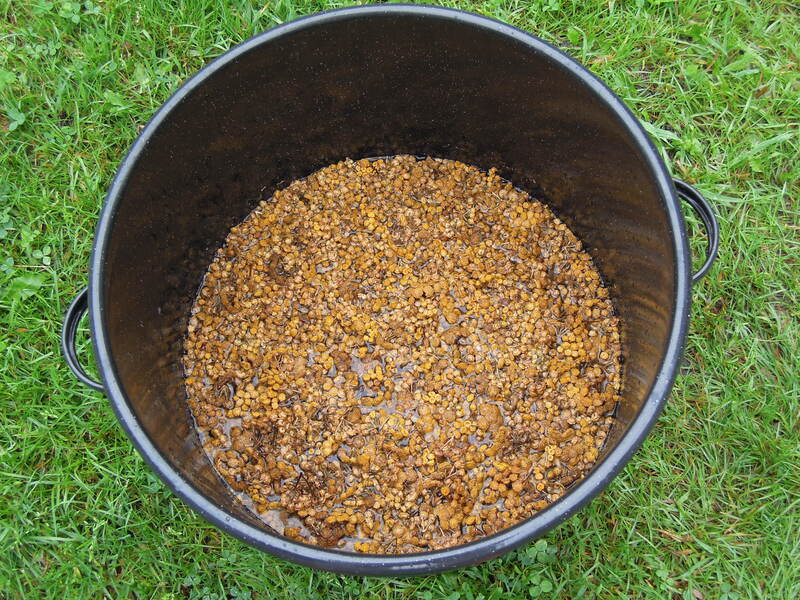 You may want to pay attention to the specific plants that you want to have seed out, being careful to not mulch heavily when they are dropping seeds ( at least around that plant). If they fall into the mulch, and work their way down into it, by wind, rain, etc, they might have a better chance to germinate. 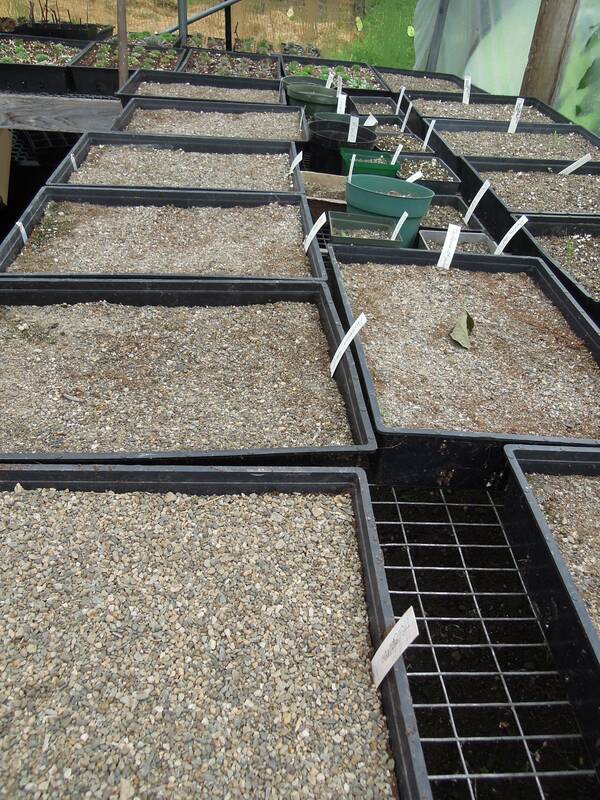 We recommend collecting the seed from your favorite plants and germinating them in a protected area. Many of the plants here at the nursery do seed out in the ground, and we are always finding new foxglove or ginger or other little seedlings that germinate right where they fall. 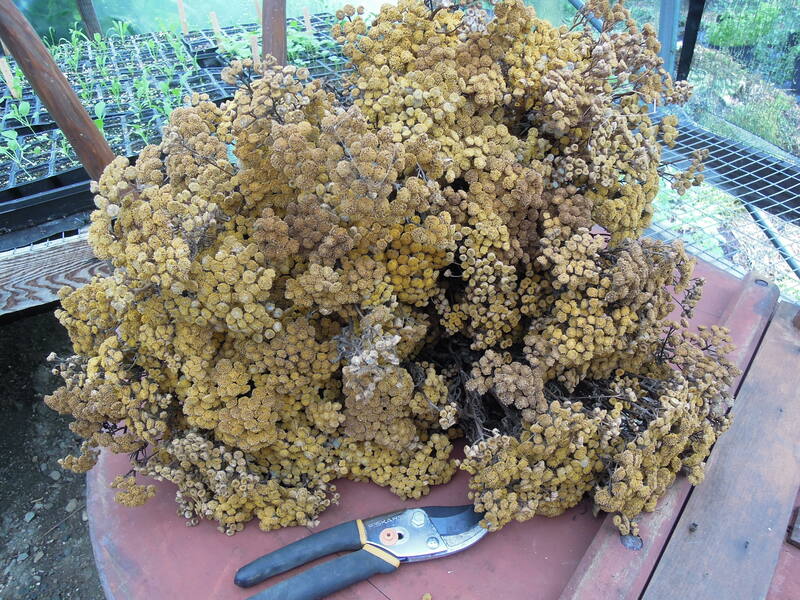 Some plants, regardless of mulch, seem prolific in seeding out…..like Senecio. Still, if you are intent on getting seedlings from a particular plant, we suggest collecting the seed to ensure better results. The tansy? Here’s how it went. 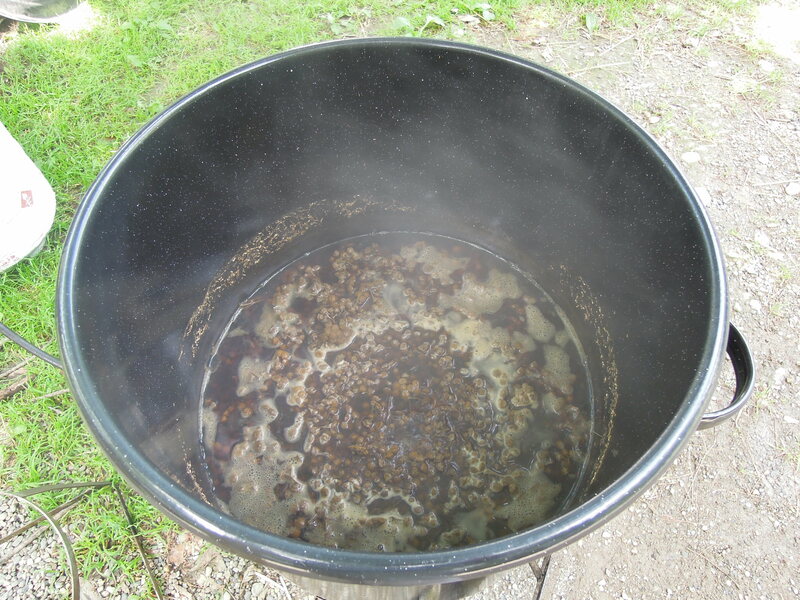 First, I must confess…..the little shephards stove I brought back from Ireland for the sole purpose of dyeing wool…was not my trusty assistant today. Too hot to be messing around ( and tending ) to a wood-fired stove today. Sorry, but it will have its day, I promise. The dyeing went well. An interesting note, ( and a personal bias, I’m sure), I threw in some merino yarn that was given to me and was not thrilled with the outcome. ( merino yarn on far left, BFL skeins from our sheep on right) It took the dye fairly well, but a bit lighter because I threw it in as an after thought. Merino just doesn’t have the shine some other sheep breeds have. Blue Face Leicester is naturally lustrous and I think it shows color and texture really well. 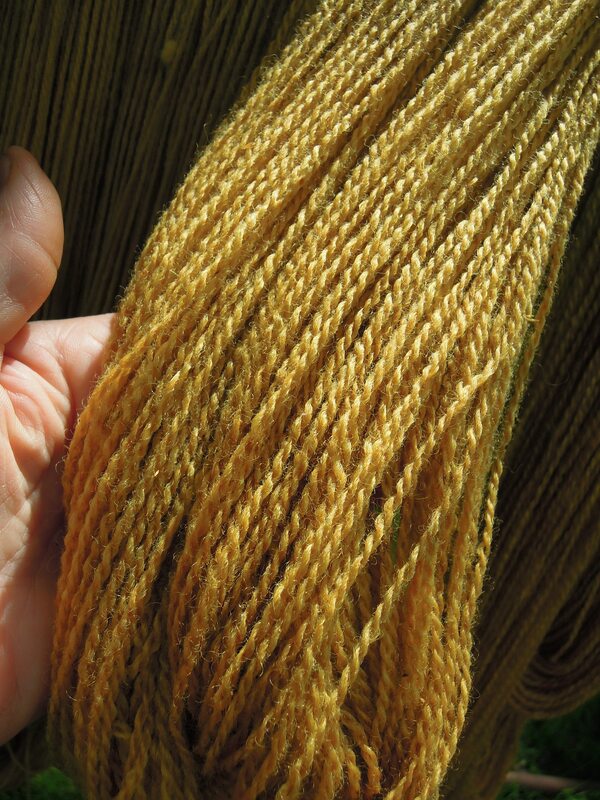 The gold color from the tansy is very nice, very warm and earthy, it almost has a bronze hue to it. Quite lovely. I saved the remainder of the dye bath, and will throw in some raw ( but washed) wool today and expect to get a bit lighter shade of the yellow. Though the merino was sort of dull in comparison, I’ll use the yarn for socks. They’ll be soft, and no one will comment on me wearing ‘dull’ socks. All in all, tansy does produce a beautiful shade of yellow, and I’m glad to have it close by to harvest. As soon as the tansy is in bloom again, I’ll be picking more. Later in the fall, when the nursery and farm quiets down, a natural dye workshop is on the list to offer as a class here at Fernwood. We’ll let you know when and keep you posted with ‘all things wool’ until then. We woke in the night to the type of rain that feels like it may float the house away….or at least the chickens and their coop. In the morning, we always head out early to see what damage has been done. The blooms on so many plants can get battered and the branches often bend to the ground with this kind of angry rain. Unsettling , this type of rain. So, another day spent tending to indoor tasks. Rick worked on sowing seed and I cut the flower heads off some tansy ( Tanacetum vulgare) I dried last year. Tansy is one of the plants I collect for dyeing wool. Yes, the tansy will be in bloom shortly, and I will go and collect more of it fresh from my favorite spots. Tansy happens to be one of the few dye plants in this area that will produce color after being dried. I always pick a bunch for winter dyeing projects. Today, I will use up what I have left from last years collection and also use some fresh on a different dyeing day. 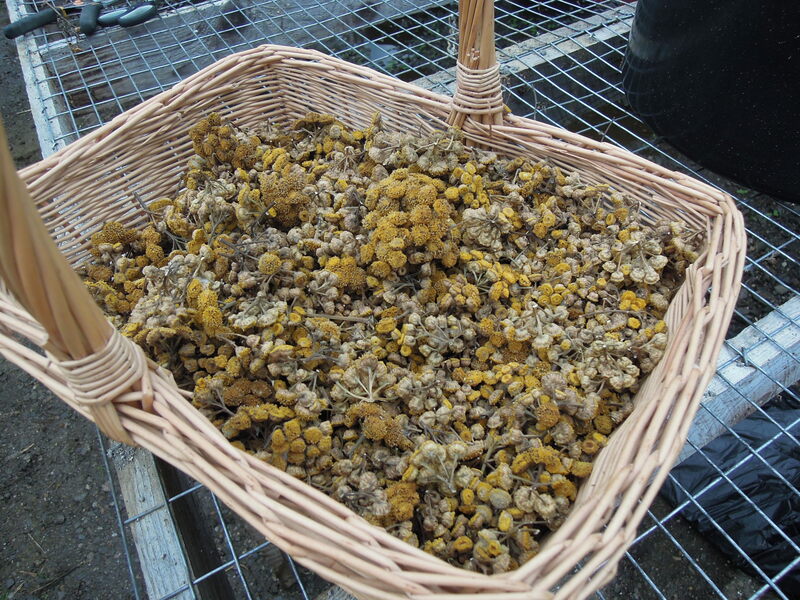 Most of the plants harvested to dye wool need to be used when freshly picked. Not so with tansy. I’m sure that back in the day, when natural dyes were all that was available to spinners and weavers, tansy was appreciated for this reason. 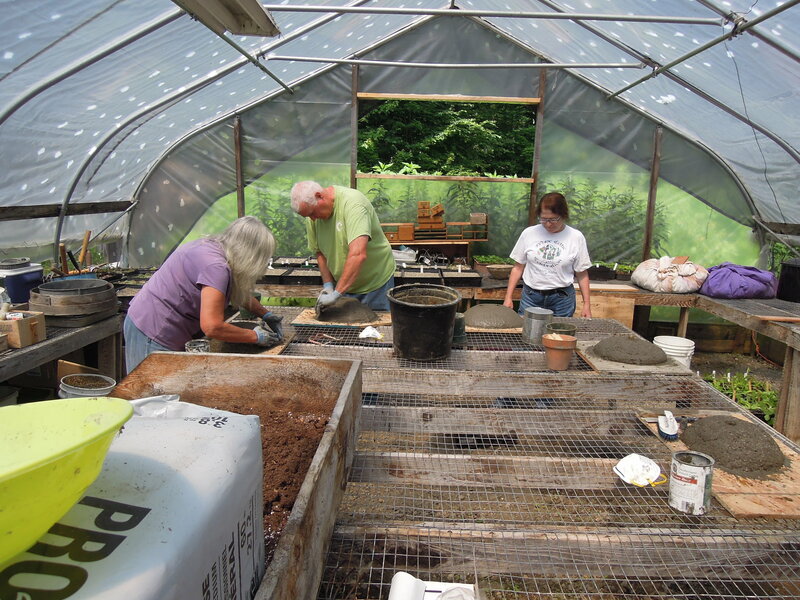 Summer can be busy with all the chores of the farm and gardens, so being able to save plant material for later use was probably very helpful to early colonists. Tansy produces a yellow dye. 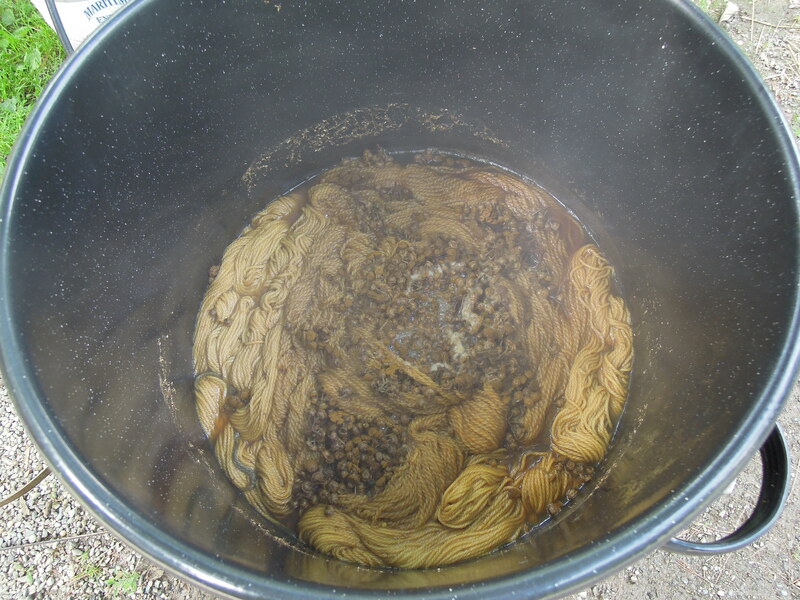 The wool gets soaked in a pre-mordent of alum before entering the pot that is simmering with the dried tansy. Alum contains metal ions that bind dyes to fabric, and it is a common mordant used in natural dyeing. With natural dyeing there is always a mordant involved. Mordants are ‘metallic salts’ that help to set the dye pigment. When the yarn or wool is submerged into a hot mortant bath, the ions bond directly to the strands of fiber. 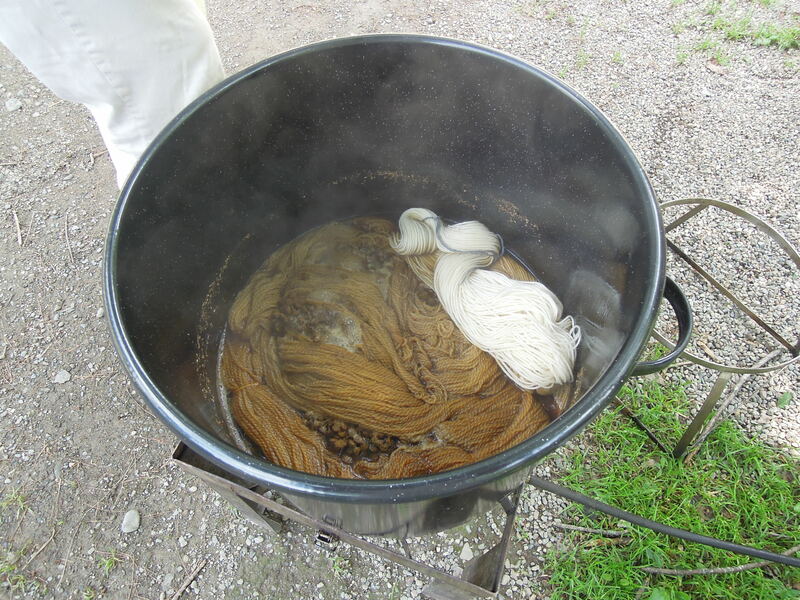 When the fiber is then put into the dye path, the pigment molecules form a chemical bond with the mordant on the fiber. This ensures that your wool takes the dye being extracted from the plant and doesn’t fade or wash out in the finished product. So today I cut the dried flower heads and will then soak them overnight in a water bath. I need to have the same weight in plant material as I do in wool….a 1/1 ratio. 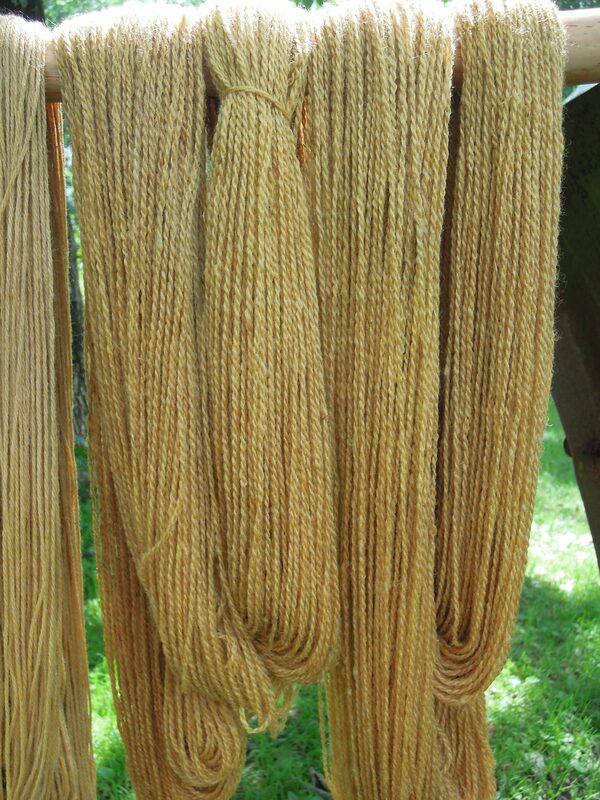 Tomorrow I will heat up the dye bath, leaving the tansy in it, and simmer this for about 2 hrs at about 180 -190 degrees. While this is simmering away, my wool will have already been soaking in a pre-mordant of alum and water. Next, I will gently put the wool into the kettle with the tansy and let it simmer for about 1 hour. I try and keep the dye bath temperature at about 160 degrees. I plan on setting up my little shephards hut stove in the nursery so that customers can see the process ( if it’s not pouring, that is), and hopefully I’ll have some golden yarn to play with after it’s done. If you’re out and about and heading in the direction of Fernwood, come check out some wool being dyed with tansy flowers ! Throughout the summer we are asked about the soil here at the nursery. People look into the display beds or the vegetable gardens and will often have many questions about what we do to improve or condition the soil. First, we don’t really consider what we add to the soil as improving it ( yes, it actually is), but instead we like to think of it as ‘feeding the soil’. It’s a living thing……it needs feeding. We grow soil like we grow plants. We nurture it. We study it. We think about what it needs, and then we give it what it wants……poop, compost, rotted leaves, grass clippings, some seaweed, and any other helpful organic matter we can get our hands on. Because we have sheep, chickens, pigs, and once a diary cow, we have access to a lot of manure. This is helpful but not completely neccessary for soil enrichment. Since we raise the critters that we do, we are happy to have the benefit of animal manure. 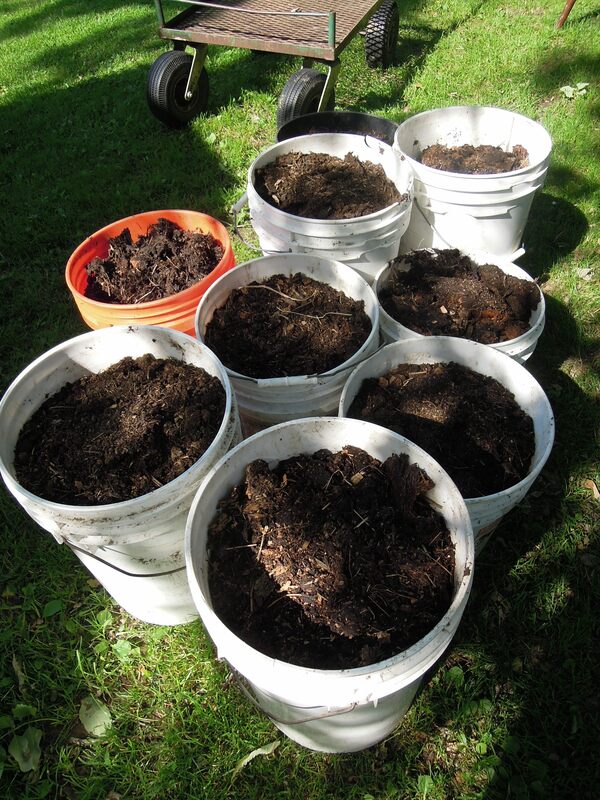 In addition, we also generate and use other forms of soil amendments, such as kitchen compost, grass, and leaves. We never really test the soil, and when people ask about this, we tell them about our approach to the soils needs and fertility. We pay attention to the weeds that are popping up. This can often be an indicator of the soil chemistry. For example, sorrel can often mean that your soil may be somewhat waterlogged or poorly drained, and acidic or low in lime. We do a bit of leaf analysis. Leaf color and overall vitality of the plant helps us to consider the soils fertility and what it may need to support the green growth above it. We smell the soil, we feel the soil…….and after years of being rather intimate with these things, you begin to understand and interpret the soil and its needs quite successfully, without ever having to do a soil test. Our very best advice is, if you want to grow good plants, start by growing good soil. Here at the nursery, we have stock piles of soil ‘food’ ( I consider these piles gold mines). 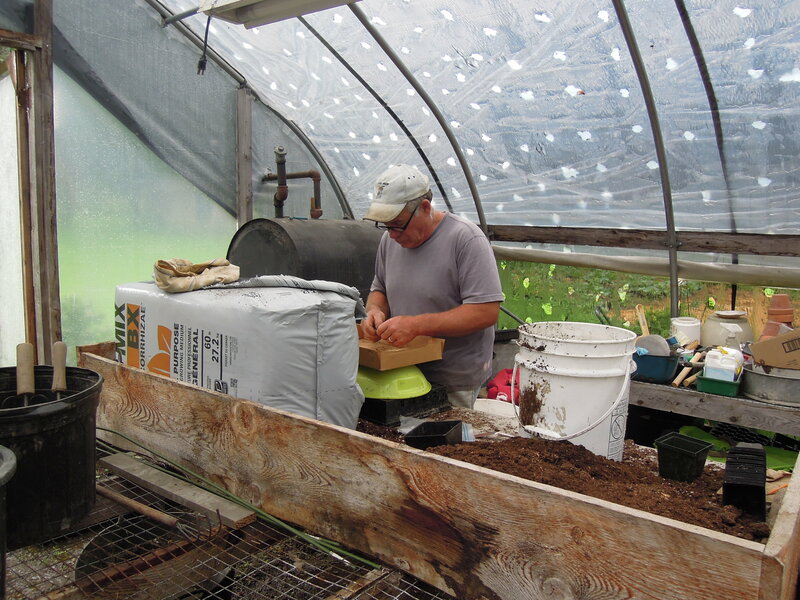 We make great effort to utilize all the animal manures and vegetative material that is generated here at the farm. This has made a terrific difference in the health and fertility of our soil. 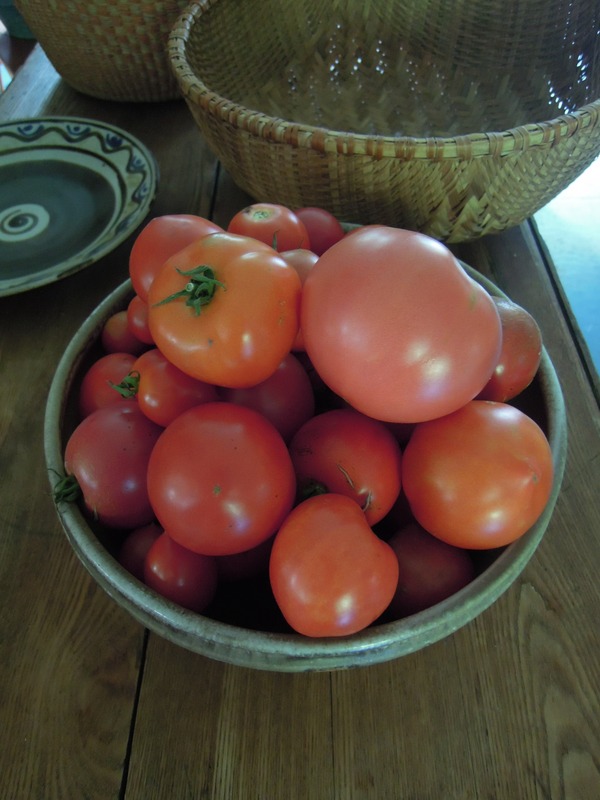 I must admit, that I can get just as excited about sifting my fingers through the soil of a freshly turned bed in the spring, as I do picking that first sun ripened, fat and juicy tomato later in the season. We welcome the questions people have about soil and soil conditions. We do not claim to be experts in the field of soil, but we do feel that our gardens are an example of some things we may be doing right. 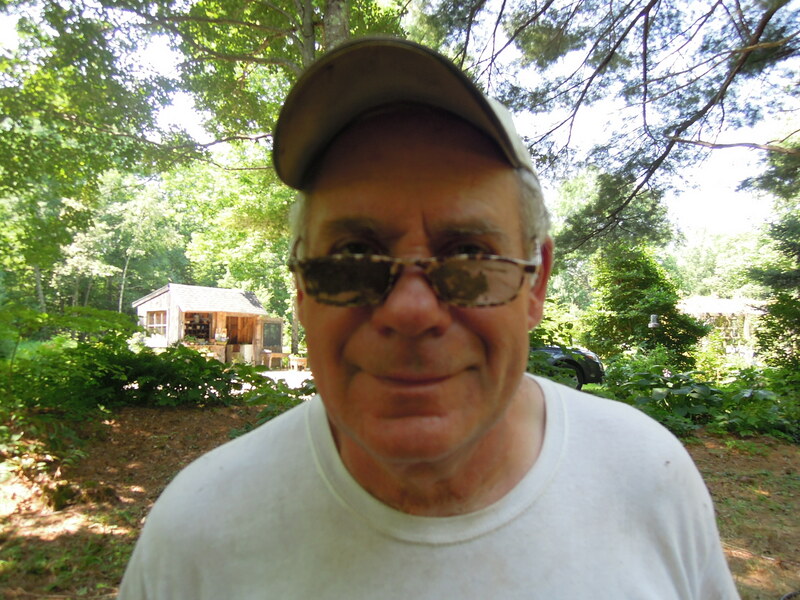 Rick loves to talk about the native plants he grows and sells, and he has a firm handle on the soil conditions each plant prefers. I just love talking about soil, and I am glutton for any organic material that we can accumulate to feed the soil with. A pile of rotted leaves or a truck load of seaweed can be a very nice birthday gift. So, get to know your soil. Pay attention to the weeds and existing vegetation. Check out the soil color and its texture. Consider the soil fauna…..how many different bugs and worms do you find? Dig up a plant and examine its roots health and structure. Become your gardens own soil steward. And feed your soil the things it needs to support the plants you grow. It will make all the difference! Classes! Still Some Spots Left! Just a reminder of some of the upcoming classes here at Fernwood Nursery. Our next hypertufa class is scheduled for Saturday, July 26th from 10:00 – 12:00. We had a grand time building hypertufa vessels back in June. We gathered around the teardrop trailer while enjoying homemade scones and tea, while Rick gave a brief introduction on hypertufa. Next we got busy building our vessels. Everyone went home with their own stone-like creation to plant with their favorite miniatures. Those interested in our hypertufa class should call or email us as soon as possible. (What’s hypertufa?…check out this post to find out). We still have a few spots left and preregistration is required. For more details, check out our Classes page. And of course, tea and scones will be served for your enjoyment. Also, an adult Fairy Garden workshop will be offered Friday, August 1st from 10:00-12:00. Liza Gardner Walsh, author of Fairy House Handbook and Fairy Garden Handbook, will be joining us here at Fernwood Nursery to talk about the history of fairy gardens and lead a workshop building miniature fairy ‘accessories’. Come join Liza here in the gardens at Fernwood to make your own tiny trellis, garden bench, or miniature arbor to take home and put in your own fairy garden. Tea and lavender shortbread cookies will be served in the garden. For more information, visit our Classes page. Again, space is limited and preregistration is required. Contact us for more information. Hope to see you in the garden! What else are we doing here at Fernwood with all the early chinese cabbage and bok choi? We’re making kimchi. Kimchi is Korean in origin and involves fermenting cabbage, carrots, daikon radish, scallions and other vegetables in a ginger, garlic, and red chili pepper paste. Very yummy and very good for you. 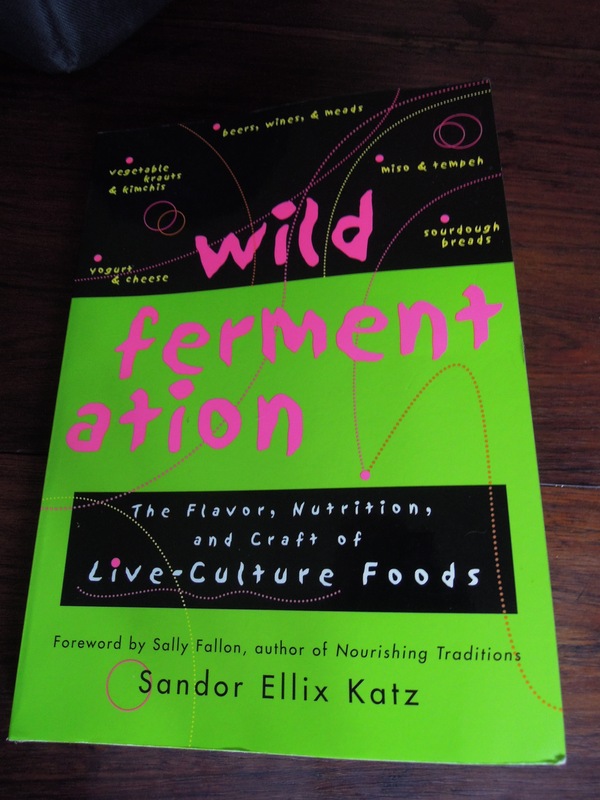 Lots of things are fermented…..sourdough bread, yogurt, sauerkraut, and pickles to name a few. 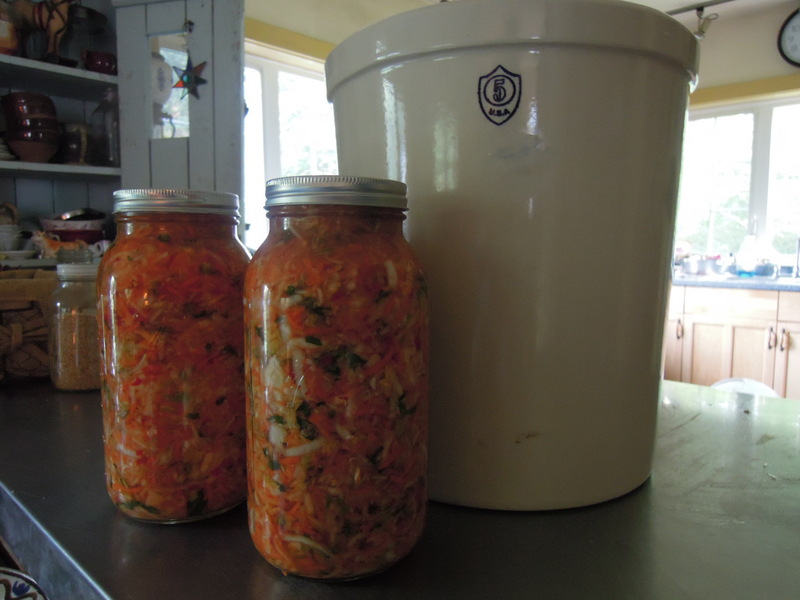 Fermentation is one of the very oldest forms of food preservation. There are many different ways to ferment food, and various ingredients that will help the process along; salt, whey, alcohol, wild yeast, and vinegar, can all be used to preserve and ferment foods. Aside from being a tasty way to preserve your harvest, fermented foods have terrific health benefits. Fermentation helps with digestion, promotes probiotic functions, and helps to release antinutrients ( compounds found in nuts, grains, and seeds that interfere with the absorption of nutrients) in the foods you eat. This weekend, lots of food was fermented in the kitchen here at Fernwood. In addition to the jars of kimchi, we made our weekly supply of yogurt, a batch of cheese ( mozzarella, riccota, and a soft Bondon), as well as some sourdough bread. Now, we’ll wait a few days for the kimchi to ripen. Once it’s ready, we’ll slice some sourdough bread, top that with some homemade cheese, and finish it off with a healthy spoonfull of spicy kimchi. Yum!